To assist with the hours of television coverage of the wedding of Prince Harry and Meghan Markle, Certas Energy partnered with FTVS (Film & Television Services) to deliver a cleaner, greener broadcast by fuelling its specialist twin set generators with Shell GTL Fuel. The fuel, which is exclusively available from Certas Energy in the UK, reduced emission levels, noise and strong-smelling fumes for the thousands of spectators lining the streets in Windsor. “As a direct replacement for diesel, we haven’t had to make any modifications to our equipment or storage tanks. The fuel’s improved combustion properties reduce emission levels of harmful pollutants such as nitrogen oxide (NOx) and particulate matter (PM) to immediately improve local air quality. Paraffinic fuels are also free of unwanted components such as sulphur, metals, and aromatics, making them non-toxic and less harmful to the environment. GTL offers another important advantage when used in back-up generators. Contamination issues can often occur when storing fuel for long periods of time caused by bacterial growth. Shell GTL however is FAME free which reduces the risk of bacterial growth resulting in a longer shelf life for the fuel. GTL Fuel also has a better starting performance in cold conditions compared to conventional diesel which is another benefit when working on outdoor sets although hopefully the royal couple and well-wishers will enjoy good weather on their special day! 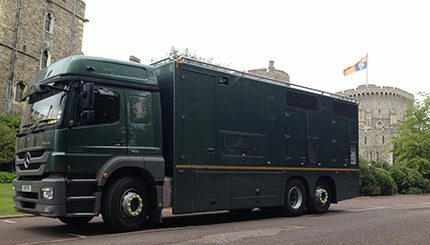 “We were delighted to work with FTVS to fuel the coverage of the royal wedding which was watched on television by millions of people across the world,” commented Certas Energy marketing manager, Emma-Jayne Brown. To find out more about the benefits of Shell GTL Fuel please click here.